I guess we've all been there. You spent a great deal of time thinking of what you hope is a thoughtful gift for someone, you hunted around for it, perhaps went over budget a bit because you really want it to be special, wrapped it up nicely, handed it over to be added to the pile at the party/wedding/under the tree or sent it off through the post. You have a mixture of feelings - happiness because you think you've got something great that they will enjoy, but also worry that they won't like it. Then you hear nothing. Did they hate it? Did they think you just picked the first thing you saw without any thought? Do they think you're tightfisted and didn't spend enough, even though it was really the best you could do? Now you're stuck between different emotions - worry you are a terrible gift giver and annoyance that maybe the recipient didn't deserve your effort because how hard is it to text 'cheers for the thing, that was nice'. Also a little bad that's you're even thinking about it - that's not a very kind way to be thinking about people after all. I think this is why I try hard to remember to say thank you for the thoughtful things we receive from others, although my profuse apologies to anyone if I have failed to do so and it was thought but not spoken as I am sure I have forgotten to say thank you too many times. It's a good thing to introduce to kids for the sake of the giver feeling thanked, but for the child I think it shouldn't be just done as a thoughtless chore of sending off a thank you note when the they don't remember what it was for. We want to be getting them to consider what they received and from whom. It's good for us to practice gratitude as part of daily mindfulness, to look for the nice things in each day, and studies have shown it contributes to our own happiness when we do this. By thinking about the fact that someone was thinking about us, it reinforces the idea that we are loved, and sets our place in our family or amongst our friends. 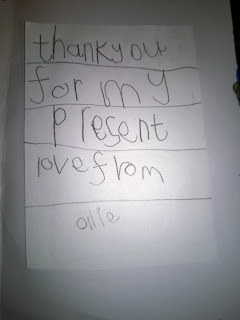 The size and expense of gift is irrelevant - Ollie was just as pleased with a picture drawn by a young friend for his birthday as he was with bought gifts, and it still has pride of place on the fridge. Most of our friends and family got a verbal thank you after his birthday, but for the Nans and Grandads Ollie wanted to do something more. So when we sat down to make thank you cards, thinking of the people who the cards were for as he made them was a big part of it. For his most elderly Nan who has vision problems, he chose to make a card with bright, contrasting colours, and with elements glued on so that there would be a ridge around the shapes that she could feel even if she couldn't see it clearly (he had been learning about the eye and eye disorders thanks to a lovely gift so he was aware of the issues she has). 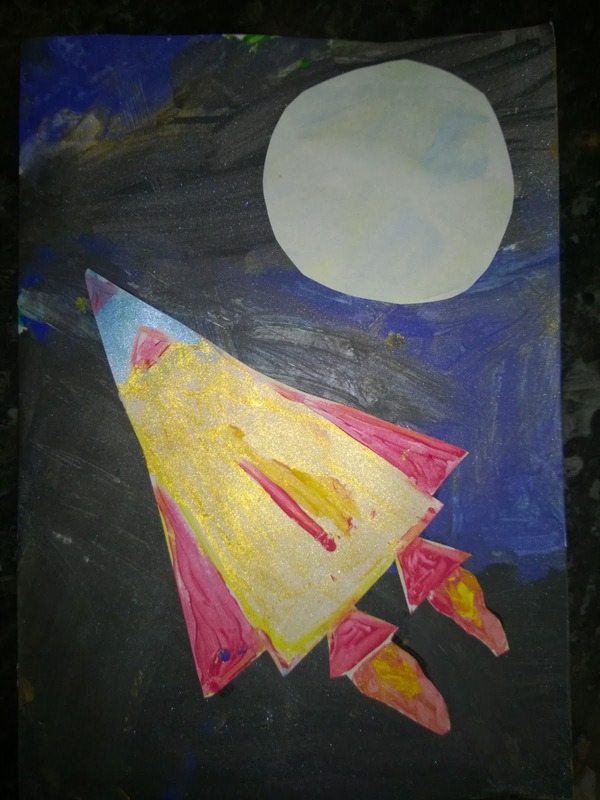 He did his biggest, clearest writing for the inside of the card, and since writing isn't his favourite thing this meant as much effort as the actual picture on the front. Cards for his other Nans and Grandads were equally carefully thought out and written out, then we went to the post office for him to post them himself. 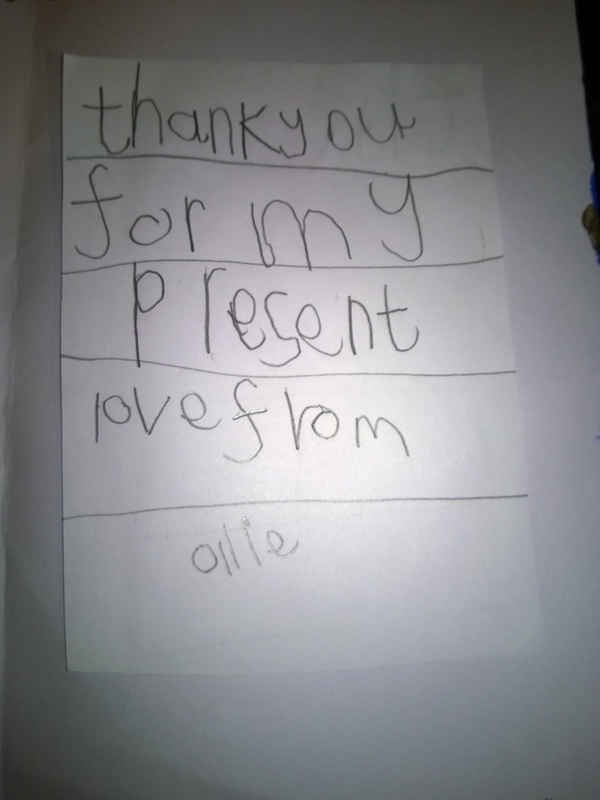 Hopefully the recipients liked them and realised that this was something Ollie had put a great deal of time and effort into because he was genuinely happy and thankful for the gifts they had given. My yoga teacher friend says that children show us and teach us a great deal, and I think she's right. How many of us, if gently reminded to say thank you, would spend hours making cards and excitedly talking about how happy we were with the things that were chosen for us, appreciating the gifts equally regardless of price or if we even particularly like it, because each represented a thought someone had for us? So when the kids next hand me some soggy gross thing they found outside as a 'present' for me, I'm hoping I can muster a proper thank you, and mean it, because that slimy leaf represents a thought they had for me (just as much as the book I'm just laying it out there might be a nice Christmas present for me from the hubbie since I was naughty and read the one he got me already and I just got a recommendation for one I'd like today, p.s. it's 'Gut' by Giulia Enders hint hint Matt).